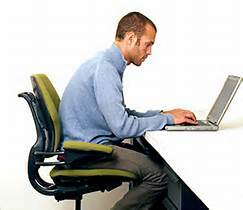 Your Posture: Avoid the Hunch! Suffering from tight and sore muscles at your desk? Your posture may be to blame! Avoid the hunched over slump by doing 3 daily posture-reset exercises. Begin each by sitting up tall with your core engaged and feet flat on the floor. 1. Pinch your shoulder blades together, then release. 5 reps.
2. Inhale/Pull your shoulders up to your ears. Exhale/Pull your shoulders down and back. 5 reps.
3. Place both hands behind your head. Pull your elbows wide and pull your shoulders down and back. 5 reps. Stand up straight with strong posture muscles! Add this pulling exercise into your workout to strengthen your upper back and core muscles. This means you’ll be able to stand up straight, for longer! 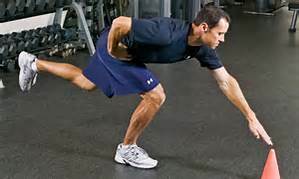 Hold an exercise band about shoulder-width apart, with your arms parallel to the floor. 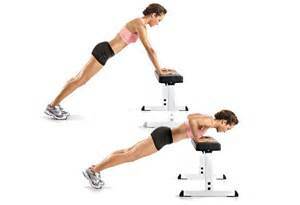 Pull your shoulders down and back, and pull your belly button in tight. Begin with the band under slight tension. Inhale, then pull your arms straight out to the side of your body. Exhale, and slowly return to your starting position with your arms in front of your body. Perform 10 times to start. *Consult your physician before beginning exercise. This exercise is not for those with injury or illness concerns.